No self-respecting boy would leave his bicycle outdoors, exposed to the weather like a neglected piece of farm machinery, because it would not be long before it would look like a “bum old bike,” and he would be ashamed to be seen riding it; also, because he knows that it would require a complete overhauling and thorough lubrication to put it back into good running order. The fellow who neglects his wheel must sooner or later learn to care for it properly or he will never become qualified to handle machinery. Sometimes it is an effort for a fellow to put away his wheel upstairs or downstairs, after a long ride, which, it would seem, has exhausted every bit of his energy; and sometimes he will foot a short distance rather than take the trouble to get his wheel out from an out-of-the-way place. To have the wheel handy-by would make it of greater usefulness, and would repay the owner for the time, labor, and expense required to provide an outside shelter. 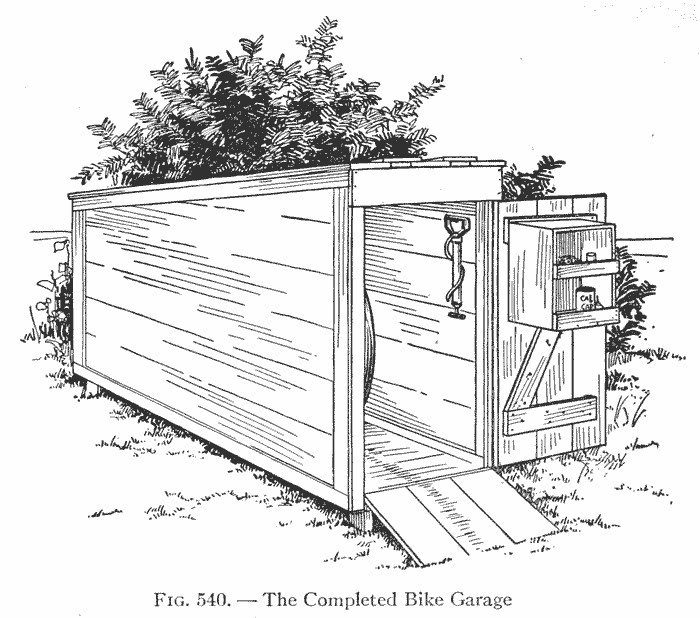 A garage like the one shown in Fig. 540, built only large enough to hold the wheel, can be set up quickly. From the working-drawings in Figs. 541 to 547 you will get all of the details necessary for building the shed. For the Working Material you will need a 2-by-4 8 feet long for the corner posts (A, Fig. 543), 72 lineal feet of 2-by-2s for the framework pieces B, C, D, E, F and G of the floor, walls, and roof (Figs. 541, 543, and 545), 175 lineal feet of 10-inch shiplap for the walls, door, floor,, roof, and runway, and 50 lineal feet of 4-inch boards for trimming around the roof, the wall corners, the doorway, and for door battens. It may be that you can get old lumber of different dimensions from the above pieces, and it may be that you have some pieces on hand which you can run in with new stuff. You can alter the plans in such a way as will best suit your material, bearing in mind of course the dimensions required to accommodate a bicycle. Instead of the shiplap specified for the boarding up of the framework, you may prefer to use tongued-and-grooved boards, or for the walls you may prefer drop-siding, which makes a neater finish. You may want to sheath up the framework with plain or matched boards, and then finish with beveled-siding, or with stucco. These are matters ‘ which you will have to decide yourself. A material man will help you to figure out quantities.